The sub-title is: Creating Worship Gatherings for New Generations. This book is a defense of emerging worship and also a guide book for those wishing to start such a service. Kimball does the typical and predictable things which all emerging church writers do. He speaks kindly toward “seeker” people and very unkindly toward conservatives. He caters to those who have never liked the church and offends those who have given their lives to the church. He speaks as though he accepts Scripture as a guide for both faith and practice, but practically ignores Scripture and finds no parallels in the Bible for the kind of worship he advocates. He speaks highly of teaching and communicating the Bible but has little or no time for preaching, preachers, or pulpits. 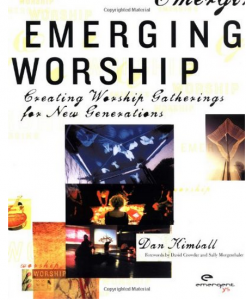 Kimball doesn’t just believe a contemporary church should start an emerging service for younger people, he firmly believes that all seeker and contemporary churches should change their entire church structure into an emerging church. Kimball speaks of traditional churches and church people as: “forced” (89), “cheesy” (85), “corny” (83), “preachy” (87), “showy” (90), “flashy” (92), “afraid” (102), “hierarchical” (105), “linear” (100), “reclusive and militant” (198), “fearing change” (214), “escaping to the comfortable past” (216). Kimball and similar writers are among those who have never liked the church the way it has been for hundreds of years. Their intent is to change it into their own idea of what it should be rather than choosing to leave it and do something else entirely. Instead, those who disagree with them are often forced to leave out of conviction. • Brian McLaren, The Church on the Other Side. McLaren is the leading voice of the emerging church movement. • Robb Redman, The Great Worship Awakening: Singing a new song in the postmodern church. About 200 pages of easy and revealing reading. • Exploring The Worship Spectrum, edited by Paul E. Engle and Paul A. Basden. This book presents six different kinds of worship services. Of course it does not have a fundamental Baptist service. • John MacArthur, The Truth War: Fight for certainty in an age of defection. MacArthur pulls no punches in his evaluation. • D.A. Carson, Becoming Conversant with the Emerging Church: Understanding a movement and its implications. This is the best detailed evaluation I’ve read.